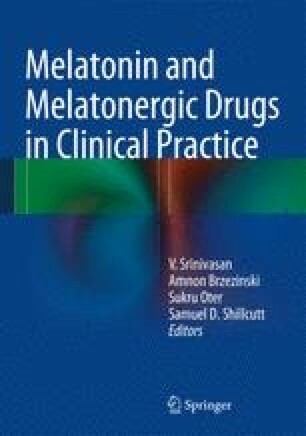 Melatonin (MEL) is a pleiotropic hormone which exerts its action through different mechanisms, either by binding to its receptors or by acting as an antioxidant molecule and ROS scavenger. Its mechanisms of action together with the wide distribution of MT1 and MT2 receptors have provoked an ever-increasing number of clinical trials in the last two decades. These studies have evaluated the exogenous administration of MEL in different doses and formulations to prevent or to treat many health disorders. The predominant field of research has been the treatment of insomnia and other circadian rhythm disorders due to the confirmed resynchronizing properties of this indolamine. However, in the last decade, a profound interest has arisen concerning its potential therapeutic value in different conditions such as cancer, cardiovascular diseases, gastrointestinal problems, and inflammatory states, among others. The relatively low toxicity of MEL over a wide range of doses has made the research even more promising. However, new multicenter clinical trials could shed light on different aspects of MEL’s clinical uses contributing thus to clarify the conditions in which MEL might be considered as a first-line therapeutical strategy and to identify when the combination of MEL with other drugs is necessary. In this chapter, we revise the milestones in the field of MEL research from its discovery to the present time and analyze the future perspectives of its clinical uses.